Mining plant manufacturer and engineer Appropriate Process Technologies (APT) has expanded its operations by installing several of its RG scrubber range plants in Angola, Ethiopia, Zimbabwe, the Democratic Republic of Congo (DRC) and Mozambique. APT is the designer, developer and supplier of the RG range of rubble scrubbers. The RG scrubber range was developed specifically to overcome the problem of tenacious African clays, which do not respond well to simple trommel scrubbers, like those used on loose glacial placers in the northern hemisphere. These mining plants are available at a variety of sizes. The RG scrubber can be combined with various downstream processing options based on gravity separation. Minerals such as gold, chromite, tantalite, tin, diamonds, gemstones, and heavy sands are recovered easily and economically. Lead times are short. The scrubber is, therefore, a process solution which increases the disintegration of placer and alluvial clays, and releases bound minerals. 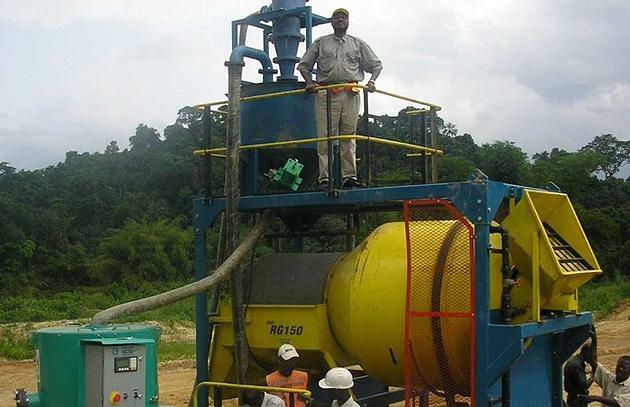 APT sold an RG60 gold plant, coupled with a Gemeni table and Knelson MD12 concentrator, to a mine in Angola, which assisted exploration efforts in the visual assessment of gold production from target areas. In addition, an RG150 scrubbing plant, operating at 20 t/h with a Knelson MD20 concentrator on board, was duly installed upon good initial results. The manufacturer’s other installations include an RG150 chromite fines plant on the Great Dyke, in Zimbabwe, which feeds up to 20 t/h and recovers about 10% of feed as saleable chromite fines. In addition, Minas Alumina, a bauxite mine in Mozambique, installed an RG150 scrubber with a small vibrating screen, which separates clays from saleable material. Minas Alumina mine owner John Meikle states that the RG scrubber has revolutionised the mine, after the mine won the prestigious Exporter of the Year award in Mozambique, in 2007. APT's RG scrubber has a cutting-edge patented design for maximum mineral recovery. For more on mining plant manufacturer company APT, please visit our website where we now have a range of these scrubbers available for online purchase. You are also welcome to contact us regarding any questions you may have.